The Fibonacci sequence, also referred to as the Golden Ratio, is an element of design found throughout the natural world. It can be observed everywhere from flowers to shells to galaxies, even in hurricane cloud formations and bird migration flight patterns. It consists of a series of numbers in which each number is the sum of the two preceding numbers, e.g., 1, 1, 2, 3, 5, 8. Famous works by the masters of the art world were composed using the Fibonacci principles. For example, Leonardo da Vinci used the Fibonacci sequence in designing his famous Mona Lisa. Photography artists use the sequence to compose appealing designs, including pieces that result in triangles as the numbers on diagonals of the triangle add to the Fibonacci series of numbers. The Fibonacci design rule is one of the reasons the composition of Icelandic horses at the top of the page is pleasing to the eye, even if the viewer is fully unaware of Fibonacci’s role at play here. It is available in large size canvases for homes and offices. Pricing details available upon request. Abstract photography is vastly creative, strongly individualistic, and open to interpretation. Perhaps most importantly, it allows photography artists the freedom to explore their imagination. The question I most often receive about abstract photography typically has to do with the practical nuts and bolts aspect of how to see the subject being considered in an abstract way. Interestingly, this is perhaps the most difficult element of the craft for this genre. I usually approach it by just allowing myself to be taken in by a scene or subject I’m exploring and seeing what sensations, emotions, and memories emerge without any expectations. While doing this, I’ll search for color-interaction and visually impactful textures and patterns. Most importantly, I’ll take my time and give myself the freedom to allow the scene “to speak to me” no matter how absurd it may at first seem or how many strange looks I get as I stare, for example, at the reflections in a puddle. In the end, abstract photography is akin to meditation as it usually gives back more than expected, opening one’s mind to a different realm of possibilities which are at first unseen. This is why I consider it one of the crown jewels of photography. The first image presents the flowing patterns and colors of the rough seas in the North Atlantic Bay of Fundy in New Brunswick, Canada. 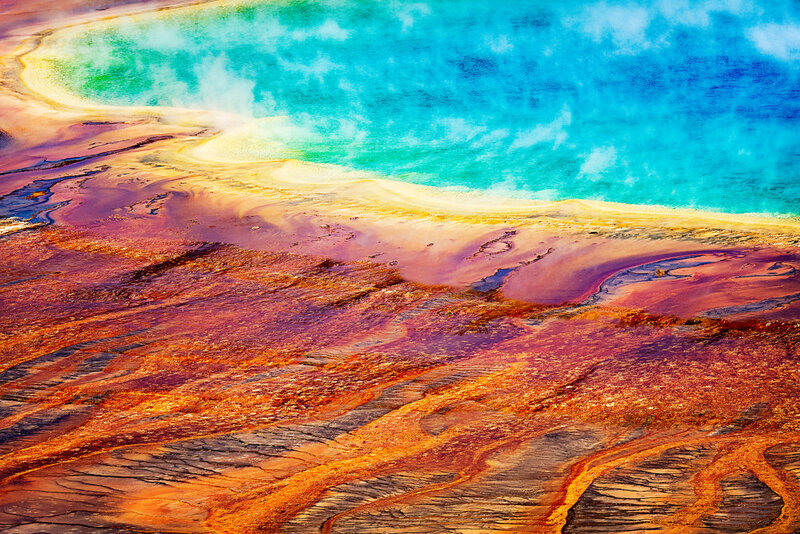 The second image highlights an aerial view of Wyoming’s Grand Prismatic Geothermal Spring. The third is an award-winning image which reveals the intricate patterns, colors, and textures of a Florida iguana during its breeding season. All three are part of an abstract photography series I worked on for Earth Aperture Natural World Imagery. My kit for this assignment included Nikon bodies, Nikkor glass, RRS and Gitzo tripods, Breakthrough Photography filters, G-Tech SSD drives, Adobe and Nik software, and DJI drones. Well executed travel photography can definitely be exhilarating, but it is not as leisurely as most people imagine. Here are some suggestions that should help maximize results. First and foremost is research; do plenty of it beforehand. Trying to find that little known road or hike while already on location will cut into valuable shooting time. Lack of research will also increase the chances of one just driving by a turnoff that could have yielded amazing vistas. In depth travel photography research typically is granular. It will cover everything from local customs and events to the angle of the Milky Way rise or the exact time of nautical twilight for a specific day and location. Meticulous planning, however, should never be so rigid as to impede the flexibility required for spur of the moment opportunities so factor in time for these as well. If you have to rest, do so at the middle of the day so you can have plenty of energy for the best light at dawn and dusk, and don’t stop shooting after the sun goes down as some of the best travel photography is after dark. Thorough planning should also include gear evaluation. Experienced travel photographers carry varied but light loads. It’s not an exaggeration to say that weight needs to be reduced to the very bare minimum to avoid numerous issues on location such as being denied boarding on a small bush plane. It’s not uncommon to hear of travel photographers who have literally cut their tooth brushes in half to lighten their packs. Gear checklists and packing lists are thus indispensable, and small handheld weight scales can come in handy. Additionally, try to include a lightweight jacket in a color that can visually stand out against a dramatic landscape so that anyone can quickly slip it on for an envisioned composition. In the end, good research will maximize your time and yield not only higher quality material but also larger inventory. Besides thorough research, impactful travel photography needs to capture the spirit of the destination and its people. In order to do this, one must get away from the crowds and permeate into the local culture. 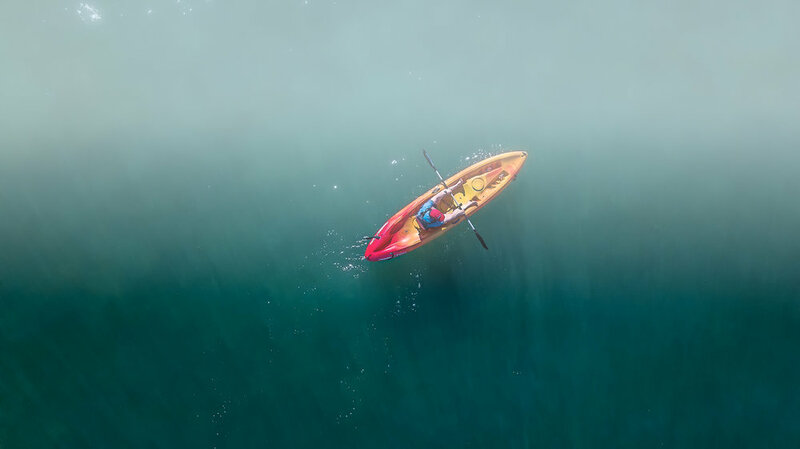 Thoughtful image compositions will give viewers an emotional connection to the travel destination from a local perspective as well as the nature and environment that surrounds it. It’s always a good idea, however, to check with locals to make sure you’re not heading somewhere dangerous. Travel photography will also be more impactful in telling a story if accentuates different angles. Lying in the grass and shooting a scene upwards or climbing a tree, cliff, or building to shoot downwards can add meaningful perspectives and scale to your work. Sometimes the only difference between a great shot and an average one is just a few feet. It’s essential to remember, however, that authenticity, not perfection, is what the best travel photography is all about; so play with angles, capture informality, reveal local customs, embrace bad weather, and contextualize landscapes from the everyday perspective of the local community without trying too hard to get that perfect shot which, oftentimes, can lack originality. In the end, photographically documenting an area's landscape, people, culture, customs, and history is truly a rewarding and mind-expanding experience which in many instances can help bring about positive social change. Implementing these suggestions will hopefully help reduce some of the pitfalls along the way. When Does Black and White Photography Work Better Than Color? When does black & white work better than color? That’s a question that many photographers wrestle with and which I’m frequently asked about. Here are a few guidelines that can help. First, check to see whether the composition you envision has any stark textures, contrasts, and shapes as lack of color can help magnify these and enhance the drama or wow factor of an image. Second, look for bad weather. The high contrast of the clouds against the light in a violent sky is usually a great choice for black and white, especially if you find yourself in a natural scene that already has strong blacks and whites like a volcanic black sand beach with active white crested waves or a vast isolated lava field or other similar high contrast landscapes with a glistening water element reminiscence of Ansel Adams’ famous Snake River and Yosemite black and white landscapes. Third, if the composition you envision is moody, melancholic, or macabre, consider black and white. Sad scenes in street photography are a good example of this. Finally, it’s good practice to always shoot RAW as this provides the maximum post-processing flexibility when converting your digital files to black and white. What is VC and Why Does it Matter? With image making tech advancing rapidly and high-res devices becoming increasingly affordable, the distinguishing features between amateur and professional photography are not always easy to discern. However, one element which I found that distinguishes the two is what I have come to refer to as VC. It is the stand out feature between the raws coming out of the image making devices of a pro and an amateur, even if both use the the exact same gear. If you haven’t guessed what VC stands for yet, it is simply the initials for Variety of Composition. This is the je ne sais quoi or elusive quality that I have found that clearly separates professionals and amateur photography card inventory. VC does not only refer to the obvious differences between a road-side snapper and an image-making pro who takes time in setting up a composition but more specifically refers to the variety of compositional content that emerges from the camera of a professional photographer. In other words, for a professional photographer, a single landscape scene has endless opportunities that will give a potential editor a myriad of choices for one vista or single wildlife subject. Moreover, pros are usually able to fully extract this compositional content variety somewhat quickly before moving on to the next scene. A good example of VC can be found in the daily work of acclaimed professional photographer Art Wolfe. In his blog, one can find images from his most recent shoots. A standout feature of his content has always been the plethora of compositional variation. Regardless of whether he is photographing nature, exotic cultures, wildlife, landscapes, or fine-art, the subjects are presented from every conceivable compositional perspective. Upon carefully examining a pro’s work, it quickly becomes evident that the defining element is not the gear but rather the professional’s ability to see the endless compositional options presented by a scene or subject. This is not to say that other factors also play an important role in professional photography but VC is among the most significant elements that distinguish amateurs from professionals. Although VC can eventually become second nature, keeping a small note card in your backpack with VC options is not a bad idea. The VC of pros may indeed sound overwhelming or a bit high-brow to many happy shooters but keeping VC in mind can certainly go a long way to improving the raws emanating from your next camera card. Below is some of my recent work, including a video and a set of stills, in which VC played a key role in photographing a single subject: Alaska Bald Eagles. Loggerhead season is currently underway. These fascinating ocean reptiles hatch on beaches around the world and then undertake long, epic migrations. Amazingly, the turtles then return to the exact spot where they were born to mate and lay their own eggs. Scientists have long been baffled by their incredible navigation skills; however, a recent study has demonstrated that these sea turtles rely on the Earth's magnetic field to find their way home since each part of the sea coast has its own unique magnetic marker which they then use as compass for their precise return. This week, I also spent time with my shark spotting drone. During this time of the year, the ocean can be murky, but if you watch the video closely, you'll be able to see the shark's prey escape a close call. After the sea turtle project, I look forward to being in Iceland and connecting with all of you on social media during that landscape photography project. For daily nature and wildlife photography postings make sure to follow on Instagram. No loggerheads yet, but this manta kept us busy today while working on the sea turtle project. Make sure to follow on Instragram for daily postings. Have a great Summer! It was a blessing to spend time up close with wildlife this winter in Alaska (see post below); however, it's time to now focus on the tropics to work on a sea turtle project. The turtles should begin arriving soon: traveling hundreds of miles to lay their eggs in the same beach they were born. It is truly amazing how this works in nature without GPS and only the stars and Earth's magnetic field to guide them. Drones help us find them without disturbing their natural behavior. I look forward to hearing from you: check out new postings daily on Instagram. 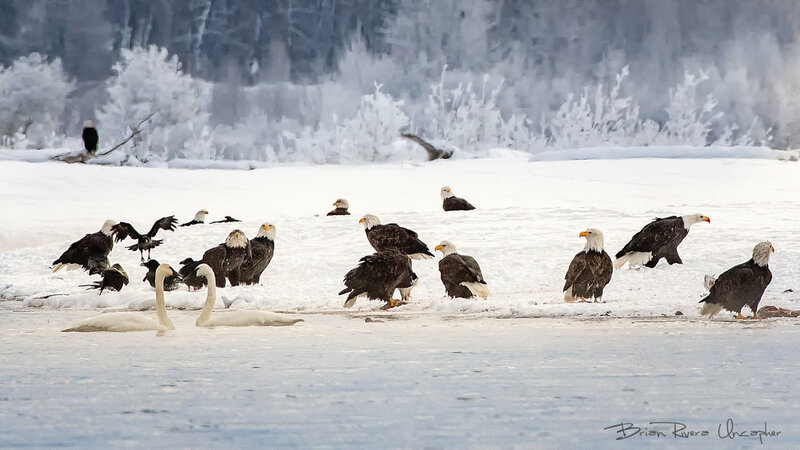 During early winter, the Chilkat River near Klukwan, Alaska hosts the largest concentration of bald eagles on Earth. The eagles gather to feast on an early winter chum salmon run. Due to a geological condition known as an alluvial fan where the Chilkat, Klehini, and Tsirku Rivers meet, the water remains ice free, permitting the eagles to catch salmon during a normally difficult season for wildlife. In this image, I sought to convey this spectacle which often is referred to as the Council grounds as the eagles return each winter here as if to participate in an annual council meeting. Often overlooked during winter due to to frigid conditions, this ecosystem during winter turns into a fairy tale of breathtaking natural beauty. Adding to the enchantment is the cultural and historical significance of this river to the Tinglit Chilkat People of Alaska - the original inhabitants of this land. Honored to be featured in this month's Landscape Photography Magazine. Published monthly, LPM and its website has over 300,000 unique visitors in more than 190 countries and is packed with abundant content. Although my photography has expanded over the years to include diverse subject matter and equipment like drones, remote cameras, and underwater still and motion images, my original photographic passion remains as strong as ever in Landscapes and Wildlife photography composed on my trustworthy DSLRs. And, most of all, have fun in composing your artwork! Don't be overwhelmed by all the technical lingo out there. Remember that good photography is more than gear or simply snapping an image, it is about creativity and exploring the art within. Most importantly, always remember that rules in photography are not meant to stifle creativity so don't feel bound to these; use "rules" freely according to your vision for the landscape in front of you. In wildlife photography, patience is your best friend and an abundant supply of it should always be in your camera bag. This image of an American Crocodile took me about two hours of quiet, patient observation and split-second readiness in the mosquito laden mangroves of southeast Florida - f/4 for 1/3200 sec., ISO 100. The American Crocodile is found primarily in the coastal habitats of Mexico, Central and South America, the Caribbean, and, at its northern most range, in south Florida. In 1975, the Florida's crocodile population was listed as endangered by the U.S. Fish and Wildlife Service. Today, it has rebounded and is considered a top example of successful conservation. However, the increase in population is not a permanent success as habitat loss in south Florida and ecosystem degradation in the Everglades continues to place the species at risk. I was in southeast Florida last weekend and put together this short clip during Hurricane Irma. There were two Cat 5s in the Atlantic coming from the Cape Verde islands after exiting the coast of West Africa. More and more of these are becoming extreme weather events in the 90 degree seas of the Florida straights, and yet our representatives have pulled us out of the Paris Climate Accords and continue to treat the symptoms through disaster relief and not the root cause of the problem. Although human-made climate change does not cause hurricanes, a warming planet increases the severity of these storms, and scientists largely agree it makes these much worse. Adding motion to your time-lapse sequence usually involves shooting on expensive rail systems that move the camera very slowly. These systems usually involve a motorized mount or tripod adapters to move the camera as the sequence of images is captured over time. The end result is a time-lapse movie that not only shows the time sequence of your subject but also shows panning or zoom movement of the scene, thereby adding a higher level of cinematography to your work. What a lot of people haven't realized, however, is that there is a cool way to add this type of motion to your time-lapse motion pictures in post production using Adobe Photoshop. This is how you do it. First, it is important to make sure that all the raw images in your time-lapse sequence have been developed per your specifications either in Adobe's Camera Raw or Lightroom and saved out in a numerical sequence as JPEG's in a specified file folder at a size of around 2400 pixels on the long side (more on this below). You can then enter the Photoshop motion workspace and open the file by navigating to the folder containing the images of your time-lapse sequence. Make sure to click on the little box indicating that your are importing an Image Sequence. Next, click Open, and select your frames per second (fps); 24 fps usually works best. The images will then be automatically converted into a movie layer which resembles the standard layers you are used to when working Photoshops's Photography Workspace. This is where the fun part and magic begins. The initial step in adding motion to your time-lapse is to create a canvas-size that will give the movie the space it needs to move. Do this by selecting Image, then Canvas Size from the top menus in Photoshop. Select pixels as your unit of measurement and 1920 pixels wide by 1080 high for your size. This will give you the HD 16:9 ratio for wide-screen viewing. Now that the canvas size is smaller, your movie can freely move inside of it, and you can even use the move tool to check this out. Remember that you can always fine tune sizes to your vision in order to achieve the creative result you are aiming for; additionally, you can also make the required adjustments to your sizes if you are creating unique vertical time-lapses which are now gaining more demand. You are now almost done. The next step is to convert your sequence layer into a Smart Object by simply right clicking on the layer and selecting Smart Object. This will change the little film strip icon on the layer thumbnail to the smart object icon and will also change the timeline color from blue to purple. Additionally, the fly-out arrow on the right side of the film strip will now allow you to click on it in order to obtain the various motion options. You can select among pan, zoom, and rotate, or a combination of these three. You are also able to select the angle; I usually select 180 degrees to pan from left to right, but this varies according each project. And, that's it! You can now preview your creation by clicking on the play button. Depending on the amount of RAM on your system, the sequence may move slowly at first. Any choppiness here, of course, will take care of itself after you render your video. If your are not familiar on how to render your video, the process is very simple; simply click on the little curved arrow icon on the left bottom area of your screen or click File>Export>Render Video and select the format and size for the video. The above process certainly won't replace all of the effects that expensive time-lapse motion gear can provide, but it certainly can add cool effects to your sequence. Give it a try, and let me know. More importantly, I hope you have fun in the process. Time-lapses are a great way to bring nature to life! Now, it's time for you to give it a go! Make sure to join my mailing list at www.BrianRiveraUncapher.com to receive my latest posts, news, and tips on The Art of Nature and Wildlife Photography. I look forward to hearing from you. Enjoy! The highest tides on the planet occur here in the Bay of Fundy where I made this eye-level image of a seal surfacing. The tidal activity here results in a fragile ecosystem that supports abundant wildlife, including over 260 species of birds and over 40 species of mammals - 8 species of whale can be found in these tidal waters. A report by US – based Natural Resources Defense Council (NRDC) shows that the proposed Energy East pipeline posses a massive threat to the Bay of Fundy and U.S. marine resources. What can we do? We can support government leaders that understand that protecting the environment is not a political issue but a human issue as our very own species survival depends on health oceans. We can also support organizations that fight for the protection of the environment on a daily basis, groups like Pacific Wild, Natural Resources Defense Council, Mission Blue, and others, remembering that human apathy is the biggest danger of all. People frequently ask me what exactly is fine art photography? Before I answer, I usually take a big breath and brace myself to answer the question in the time it takes to ride a few floors in an elevator as they usually expect a quick answer. And, despite my apprehension to answering their question, I have come to realize that most good answers are the ones that are simple and direct. Hence, I begin by clarifying that fine art photography does indeed have objective criteria despite falling in the subjective and vast realm of art. The principal and underlying criteria that distinguishes fine art photography from other fields in photography is that fine art photography is not about digitally recording a subject. Using a camera to document what exactly appears in front of the photographer usually falls under the category of photo-journalism and is frequently found in publications that feature images of a scene as it exactly existed at a precise moment in time. So, a fine art photograph must go beyond the literal representation of a scene or subject. It must deeply express the feelings and vision of the photographer and clearly reveal that it was created by an artist and not by just the camera. It must be clear that it involved an original, deliberate creation and that every aspect of making the photograph in the field and in the photographer's post-processing digital studio, including the printing, are an individual expression from within the artist. Below are examples of four fine art photographs which I recently completed: 1. Humpback - composed in San Juan Islands, WA; 2. Bold Coast - near Bar Harbor, ME (Honorable Mention, 2016 International Photography Awards); 3. Canyon Spires, WY; 4. 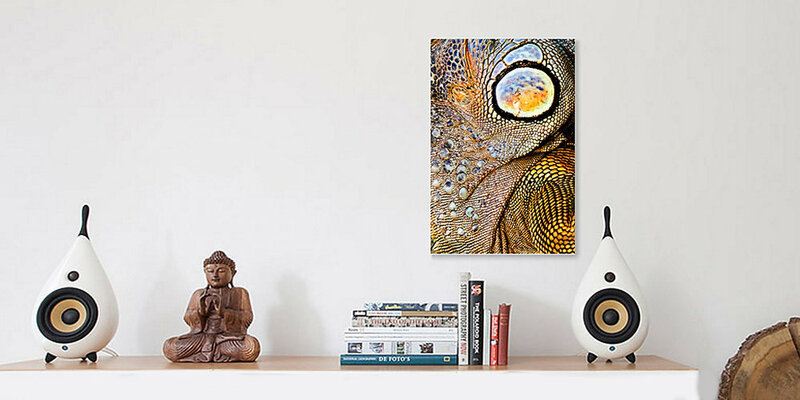 Iguana Skin in Breeding Colors - (Winner of Art Wolfe, Inc.'s Photography as Art Contest). I have always been interested in shadows, especially watching how they move and envelop light. The ever-changing lines, angles, and shapes they form and how they penetrate into natural textures like rocks, mountains, and forests are surreal to explore. I also like to search for wildlife in shadows and make photographs of their shadows in motion. Here is an image I made as shadows quickly raced across the valley beneath Longs Peak, CO., a great climbing face. In recent years, academia has confirmed what many people have intuitively known for generations, namely, that nature is not only good for our health but also good for our souls. For example, a recent study at Stanford University which included brain scans concluded that daily walks in nature had a scientifically measurable impact on mental health and well-being. Likewise, studies at the University of Michigan found nature to be an important "non-pharmacological approach to serious conditions like depression." Numerous other academic studies have reached similar conclusions, giving scientifically confirmed credence to the timeless writings by nature enthusiasts such as Ansel Adams, John Muir and the many others whose life work contributed so much to the establishment of what Wallace Stegner called "the best idea we ever had" - Our National Parks. Our National Park system not only symbolizes America's beacon of freedom but also provides the place for each American to rediscover in nature the things of the heart and spirit. Like art, appreciation of nature makes us human; it is in our DNA as scientific research now so overwhelmingly concludes. It is no wonder, therefore, that no activity of the federal government spawns such public loyalty and emotional support as our National Parks. These lands of immeasurable beauty were set aside under the truly patriotic and fundamentally American ideal that one generation's desires should never put at risk America's legacy to future generations; America's best idea would ensure that preservation would prevail against exploitation and that one generation's quest for profits would not destroy the sacred land which, if destroyed, would, as Ansel Adams wrote, "shrivel the spirit of the people." This year America celebrates the 100 year anniversary of our National Park System. It is not only a good a time to reflect and give thanks for the efforts of the great Americans who have brought us this far but also a good time to explore additional ways to ensure that the patriotic efforts of the people that worked so hard to protect the National Parks do not go to waste. Today, everyone is familiar with the depletion of fish and wildlife and the shrinking forests as well as the man made changes to our climate that threaten everyone; however, perhaps not everyone remembers the dust bowls and other tragedies that devastated the lives of so many Americans when the land was abused. An anniversary is a perfect time to look back and double down on efforts to protect our National Parks. Photographers and artists have played key roles in these efforts. In the 1860's, the work of artist Thomas Moran and photographer William Jackson helped persuade Congress and President Ulysses Grant to establish Yellowstone as the first national park in 1872. Likewise, the work of John Muir and Ansel Adams documented and captured the grandeur of America's nature leading to increased conservations and preservation efforts for lands in our National Park System. Today, advanced digital photography techniques can bring into every home the Milky Way from the top of Cadillac Mountain in Acadia National Park to the waterfalls deep inside the Olympic National Park and beyond, serving as additional conduits to highlight the American values of land preservation. As a nature and wildlife photographer, I feel privileged to participate in this endeavor and work hard to make images which elevate nature from mere scenery to a more profound place within us; a place in which nature resonates and inspires our very core; a place in which the intangible values of our existence reside. Understanding wildlife behavior is critical to natural world photographers. Good, solid research prior to a shoot can substantially improve the probabilities of returning with abundant inventory. One of the cornerstones of wildlife behavior patterns is the subject of migrations. In bird photography, fall and spring migrations can be a fascinating time if properly understood. For instance, fall migration for many species not only starts earlier than most people realize but also lasts longer depending on both species and regions. Shorebirds can be on the move as early as June and raptors can continue their migrations into December. Additionally, it is important to stay abreast of weather conditions as many birds wait for favorable conditions before starting their migrations. So, in order to avoid returning with happenstance photography from your shoot, make sure your research includes, species, region analysis (e.g., water sources, stopover duration, etc. ), breeding cycles, and weather. Below is a composition of Ibis during spring migration over Merritt Island's National Wildlife Refuge. Showing motion and speed in images is a great way to enhance the art of photography. Ernst Haas, one of the first highly acclaimed photographers to utilize this technique, expressed his thoughts on this art form in the following passage. Haas not only changed color photography forever but also introduced the art world to the melody of motion in still photography. Today, this form of photography is often referred to as panning, and, as a nature and wildlife photographer, I use it not only to express the mood, motion, and mindfulness of landscapes but also to reveal the emotional and exhilarating action of wildlife. Having followed the work of Art Wolfe for several years and having studied most of his books, I am grateful and honored to have won his recent Photography Competition. I learned of his contest by following him on Instagram, and when the opportunity arose to participate, I jumped at it. Considered one of the top photographers in the world, Art Wolfe has graced us with an impressive body of work which will inspire generations of photographers and artists to come. As Wade Davis so eloquently put it in his Introduction to Art's Earth is My Witness book, "One can smell in his photographs the dirt of Africa, feel in them the chill of an Arctic wind, taste the bitterness of the plants, bear witness to the innumerable silences of the stars, and hear in his landscapes the slow sound of the continents inexorably in motion." So, it has truly been an honor to have my work recently recognized by Art Wolfe and his team. The competition emphasized Photography As Art, specifically patterns. The contest is part of a series that explores the various elements of design which are essential to making compelling photographic compositions. I made the photograph as a study of patterns in the natural world; it features the mosaic-like skin of an Iguana in its breeding colors. The intricate design, diverse textures, and unusual shapes highlight the art so readily found in nature. I hope you enjoy the image.